No sooner was Christmas over than the shops were going into a pink, fluffy, heart shaped frenzy over the next opportunity to part the public from their hard earned cash - Valentine's Day, named for a saint who's head is now kept in a church in Winchester. Maybe he lost his head for love. Well, actually he didn't. There is no romantic link to St Valentine at all. We have Geoffrey Chaucer to thank for that. Cheers Geoff! Now, it's just become another excuse for florists to rack up their prices and manufacturers to think of ever more creative ways to 'St Valentine' their products. It's also a day where teenage angst reaches fever pitch. Will they or won't they get a card? If they do, who sent it? Was it a secret admirer? A boyfriend? Their mother? Apparently 8 million Americans send themselves Valentine's cards. It's also a day when people are pressed into making declarations of love that they may or may not feel able to carry through. Excited partners receive cards expressing undying love and devotion because there's no card saying 'Be Mine... for the moment anyway' or 'To the One I Quite Like But It's a Bit Early to Talk about Love'. The Husband and I don't 'do' Valentine's Day. We used to in the early days. I still remember driving across London, from my home in Putney to his in Ealing, clutching a box of heart shaped cookies I'd made for him - and bearing in mind that I'm to baking what Jeremy Clarkson is to international diplomacy - this was a serious declaration of love. And not least because I had to be up at 5am to get them onto his doorstep by 7am when he left for work. On the way home it started to rain; not just a shower but driving, torrential, sideways rain. When he left the house he trod on the box, which was by then soggy and the cookies bloated with water. He wasn't even entirely sure what they were. So much for that. A few years followed with a dozen red roses arriving at the office, which I usually went on to kill because I forgot to replenish the water. Then he went away filming and forgot to send me a card. I had, of course, sent him one. I was upset and the next year I didn't send him one. He sent one to me though, so he was upset. In the end we agreed that we just wouldn't bother. We didn't need a fluffy toy or a soppy card one day a year to know that we loved each other. So today was spent up in London worshipping at the shrine to Mammon that is Westfield Stratford City.Actually, the Girl is going to stay with her best friend from France who now lives in Essex and this was midway between us both. It was like one of the rings of hell in Dante's Inferno and I left vowing never to go again unless they opened it up just for me and me alone. 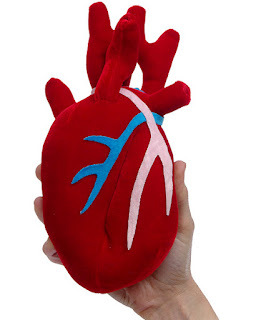 anatomically correct beating heart... seriously! You think that's a heart? I think it's a mutant Rudolph. Look at the reindeer horns. It's old Christmas stock, the stuff that didn't sell, remarketed as Valentine's. That felt heart was deeply discouragng...but I don't know why. Haha, I sent my beloved an e-card from jimpix.co.uk guaranteed no fluffy kittens or cute nauseating verses. He came over last night and we drank a bottle of champagne that we should have had on his birthday but couldn't cos he was called to Paris, so that was handy. My teen son said he had received no Valentines wishes and had sent none so it was all a bit underwhelming in our house, and tant mieux! My wife and I treated ourselves to a nice meal in our favourite restaurant... a much better use of our money and our time. Iota, See! What did I tell you? Fly, it brings a new meaning to the word 'heartfelt'! Steve, well thanks for the invite! Hubby, son and I went shopping in Cambridge yesterday. It was cold, we did the Park and Ride but roadworks and half-term meant the buses were out of synch so I got even colder. Son and husband got new clothes. I got nuffin! TOOT, TOOT! In which I blow my own trumpet..